Gauss famously discarded Abel's proof that an algebraic equation of degree five or more cannot have a general solution (Abel himself had rejected divergent series as the work of the devil). Cantor's theory of transfinite numbers was originally regarded as so counter-intuitive—even shocking—that it encountered resistance from mathematical contemporaries such as Leopold Kronecker and Henri Poincaré and later from Hermann Weyl and L. E. J. Brouwer, while Ludwig Wittgenstein raised philosophical objections. Ramanujan's work on divergent series was rejected by three leading English mathematicians of the time before he was discovered by Hardy. The above stories have become mathematical folklore. I would like to know the examples of other mathematicians whose works were initially criticized or rejected by contemporaries but later became widely accepted famous. I am particularly interested in modern mathematicians or lesser known mathematicians of the classical era who stories may not be as popular as those of other mathematical giants. It is also mentioned on the nLab page for Homotopy Group and here on Wikipedia. (1) the stories that have no factual basis and are pure myths (e.g. the one about Hilbert rejected by Gordan, or Grothendieck rejected by you-know-who, etc.). I'd like to add Fourier to this category but here I don't know the history well enough to be sure. What is certain is that Cauchy, faced with a contradiction between Fourier's result and a theorem he "proved" (limit of continuous function s is continuous) did not dismiss Fourier, and that others quickly dismissed (rightly) Cauchy's result. (2) The ones that don't really concern mathematics: Boltzmann, Bolzano (whose work in mathematic become admired as soon as it was known, and was controversial for something else), Giordano Bruno, and even Brouwer, who as a mathematician was respected and even admired by about everybody else, and was only controversial as a philosopher of mathematics - and certainly no more than any other philosopher is controversial. (3) The few ones that have a factual basis and do concern mathematics. I will restrict my attention to these cases as they are the only ones that really answer the question. Now, I am afraid that in each of these stories, where a romantic genius makes a discovery that is ignored or rejected by the conservative establishment of mathematics, my heart is with that so-called establishment, whom I can accuse of no wrongdoing, even with the benefit of the hindsight. Indeed, in none of these cases has the "romantic genius" been persecuted or even bullied (as was for example Giordanno Bruno, or to a lesser extent Gallileo). We, the mathematician community, have no auto-da-fé (not to speak of bonfire) in our history to apologize for. What happens in all those cases is that there was a genial mathematician whose works suffered from serious shortcomings, and it was those shortcomings, and not the ones of the mathematical community, that made the process of assimilation of these works by the community longer than it could have been. Lévy, are we said, was a great probabilist, but not very rigorous. I agree with this description. Now is his work not being rigorous a plus, or a minus? To me the answer is obvious, and I hope everyone here agrees with that. At roughly the same time, Kolmogorov was founding rigorously abstract probabilities on Lebesgue's theory, and this gave his theorems a convincing power that Lévy's have not. The mathematical community has done actually a pretty good and relatively quick work in making Lévy's results rigorous and putting them in the mainstream theory. Cantor is an interesting case. An absolute genius, for sure, with sometimes almost idiotic remarks -- like when he writes to Dedekind that his bijection between the line and plane refutes the basic idea of dimension. Dedekind kindly answers to him that people working in geometry only consider continuous functions. Now it is perfectly normal and healthy that his works in set theory were exposed to such harsh criticism in his time. There were serious foundational problems in what he was doing. From the important point of view of rigor, he was putting mathematics back to the time of the early calculus, forgetting all the progress in rigor made in the nineteenth century, and indeed, there were as is now well-known some serious paradoxes hidden in his theory. The harsh criticism against Cantor's work (such as Poincaré's) was the anti-thesis in a dialectical process, where the role of the synthesis was played by lovers of the Cantor's paradise, that didn't want to lose rigor and admit paradoxes. Hilbert was forced by those very criticisms to develop a far-reaching program of mathematics in order to clear the discovered inconsistencies. Now the partial failure of Hilbert's program (Gödel's incompleteness and inconsistency theorems) shows that there really was something rotten in Cantor's paradise, and the indecidability of Cantor's favorite problem (the continuum hypothesis) retrospectively gives weight to Poincaré's criticism: arguably, Poincaré never asked a question which was later shown to be undecidable, unlike as with the continuum hypothesis or questions of the gender of angels. Galois? Well, he has the best possible excuses for having written his genial discoveries in such an unreadable way: he wrote them partly in jail, partly the night before his death, and all before he was 22. Now for the very same reasons the mathematical establishment (the "Académie des Sciences", including people with a very different mind, like Fourier) have good excuses not to understand what he had done immediately. And again, very soon after his death (about 10 years after), his work was exhumed, intensely admired and integrated into living mathematics (especially by the German school). PS: please feel free to vote down this unromantic post. My earlier self would probably have done so. The claim about "single-handedly founding linear algebra" seems exaggerated. For a closer investigation, one might e.g. look at the articles by D. Fearnley-Sander quoted and referenced in the wikipedia article. Added: After reading (small) parts of Engel's biography (vol. III.2 in Graßmann's Gesammelte Werke), I feel that the quotations above are kind of unfair towards Moebius and Kummer. Moebius actually put quite an effort into supporting Graßmann, for several years. Regarding Kummer, it should first of all be noted that Graßmann did not submit his work as a Ph.D. thesis in the modern sense, but sent it, along with another work, to the ministry, to apply for a professorship at some university. Kummer's report (reprinted there, pp. 126--129) is ambiguous, in that he harshly criticises the form, but admits that "diese Schrift wirklich neue und interessante Gesichtspunkte gewährt, so daß ich über den wissenschaftlichen Wert des Inhalts mich wirklich lobend und anerkennend äußern kann". Kummer indicates that more profound results may be found in Graßmann's work with more effort. But for a teaching position, he suggests, there are younger excellent mathematicians with much better style of exposition. He also says that he has no reservations against awarding Graßmann the title "Professor", but given Graßmann's deficits in exposition, he has doubts about him as lecturer; however, he says, it could still be enquired whether his oral teaching abilities are better (given that Graßmann was a school teacher). Apparently, the ministry did not take the last suggestion serious, but wrote to some lower school office whether it would be OK to award Graßmann solely the title; the office advised against this, saying it would cause trouble with superior teachers who did not have this title (...). So the ministry wrote back to Graßmann, dismissing his wishes. -- Frustrating as this must have been for Graßmann, but given Peter Michor's comment, I agree that many statements in Joël 's answer do apply very much to Graßmann's case. The axiom of choice was formulated by Zermelo in 1904 in order to prove his well-ordering theorem. The axiom of choice was strongly criticized by many famous mathematicians, including Baire, Borel, and Lebesgue. Nowadays, of course, although a minority of mathematicians still reject it, the axiom of choice is accepted as part of mainstream mathematics. Paul Lévy was an extraordinarily productive mathematician: in parallel with and independently from the Soviet mathematicians Kolmogorov and Khinchin, he discovered the major part of what is known today as the theory of stochastic processes. Among his contributions where the study of various properties of Brownian motion and the discovery of necessary and sufficient conditions in limit theorems for sums of independent random variables. He proved the Central Limit Theorem using characteristic functions, independently from Lindeberg who proved the same theorem using convolution techniques. He discovered the class of probability distributions known as "stable distributions" and proved the generalized version of the Central Limit Theorem for independent variables with infinite variance. He also introduced the notion of Brownian local time in the context of study of the properties of Brownian motion: today this concept plays a key role in the study of fine properties of diffusion processes. Michel Loeve gives a vivid description of Lévy's contributions: ``Paul Lévy was a painter in the probabilistic world. Like the very great painting geniuses, his palette was his own and his paintings transmuted forever our vision of reality... His three main, somewhat overlapping, periods were: the limit laws period, the great period of additive processes and of martingales painted in pathtime colours, and the Brownian pathfinder period." Although he was a contemporary of Kolmogorov, Lévy did not adopt the axiomatic approach to probability. Joseph Doob writes of Lévy: "[Paul Lévy] is not a formalist. It is typical of his approach to mathematics that he defines the random variables of a stochastic process successively rather than postulating a measure space and a family of functions on it with stated properties, that he is not sympathetic with the delicate formalism that discriminates between the Markov and strong Markov properties, and that he rejects the idea that the axiom of choice is a separate axiom which need not be accepted. He has always travelled an independent path, partly because he found it painful to follow the ideas of others." This attitude was in strong contrast to the mathematicians of his time, especially in France where the Bourbaki movement dominated the academic scene. Adding this to the fact that probability theory was not regarded as a branch of mathematics by many of his contemporary mathematicians, one can see why his ideas did not receive in France the attention they deserved at the time of their publication. P.A. Meyer writes: "Malgré son titre de professeur, malgré son élection à l'Institut ... Paul Lévy a été méconnu en France. Son oeuvre y était considérée avec condéscendance, et on entendait fréquemment dire que ce n'était pas un mathématicien." Translation: Although he was a professor and a member of the Institut [i.e., the Academy of Sciences], Paul Lévy was not well recognized in France. His work was not highly considered and one frequently heard that "he was not a mathematician". However, Paul Lévy's work was progressively recognized at an international level. The first issue of Annals of Probability, an international journal of probability theory, was dedicated to his memory in 1973, two years after his death. Brouwer's intuitionistic mathematics was heavily criticized by his contemporaries, most notably Hilbert. For almost a century it was casually ridiculed by mathematicians who had no clue whatsoever about it. However, in the late 20th and early 21st century the importance of intuitionistic logic was recognized by mathematicians who worked in areas close to computer science. By the late 21st century the tables were turned and most mathematicians were educated in the tradition of Martin-Löf type theory (a starting development for many mathematicians born in the 20th century, who dismissed Martin-Löf's work on the grounds of it being useful exclusively for philosophically commited constructivists) . In their ignorace they now considered ridicule of Zermelo and Fraenkel an appropriate activity. Will they ever learn? Perhaps the canonical example is Nikolai Ivanovich Lobachevsky? His work on hyperbolic geometry was subject to severe ridicule, stemming from a negative review of Ostrogradsky, the leading Russian mathematician of the time. Perhaps the severity of the ridicule piled on Lobachevsky was part of the inspiration for Tom Lehrer's song Lobachevsky? Needless to say, Lobachevsky's work became widely accepted later. Boltzmann's mentor and colleague Josef Loschmidt criticized Boltzmann's demonstration of entropy increase on the grounds that dynamical laws are reversible. If all the particles could be turned around exactly (or if time could be reversed), Boltzmann's work indicated the entropy should decrease, violating the second law. Eventually he committed suicide out of depression. Today the above equation is one of the most important and fundamental equations of science. Surprised no one has mentioned Fourier. His idea that you could express arbitrary functions as infinite sums of sines was initially rejected. Who: Lucjan Emil Boettcher (1872-1937), working in the theory of iteration, dynamics of rational maps and functional equations. What he is nowadays famous for: Boettcher theorem, Boettcher equation and Boettcher coordinate. All these related notions describe behavior of an analytic function $f(z)=a_pz^p+..., \ p \geq 2$ in a neighborhood of the fixed point $z=0$. They are important in holomorphic dynamics. Who first recognized his work: Joseph Fels Ritt, in his paper On the iteration of rational functions. Trans. Amer. Math. Soc. 21 (1920), no. 3, 348-356. Ritt seems to have given the first complete proof of Boettcher's theorem. What else should he be famous for: Boettcher gets credit for constructing the first Lattes-type example of an everywhere chaotic map (see this MO question: The half-life of a theorem, or Arnold's principle at work). But he also should be recognized for pioneering the Fatou-Julia theory (20 years before Julia and Fatou, and without the advantage given by the notion of normal families) in his study of regions of convergence of iterates of rational maps and their boundaries. E.g. he described the Julia set for a monomial and for a Chebyshev polynomial of an arbitrary degree no less than two. More importantly, he also first stated an upper bound for the number of non-repelling cycles of a rational function in terms of the number of its critical points (in 1920s conjectured again by Fatou and proved to be sharp in 1980s by Shishikura). An interesting twist: In principle, the committee members were right! At best, Boettcher only sketched his ideas. At worst, he really worked with ill-defined objects (he did study iterates with arbitrary exponents...) or made mistakes (e.g., in describing properties of ``boundary curves" of regions of convergence, better known as Julia sets). He also published some of his results multiple times and often devoted many pages to detailed analysis of other mathematicians' work (Koenigs, Leau etc. ), so his articles could come across as derivative. English wikipedia: "Bolzano's posthumously published work Paradoxien des Unendlichen (The Paradoxes of the Infinite) was greatly admired by many of the eminent logicians who came after him, including Charles Sanders Peirce, Georg Cantor, and Richard Dedekind. [...] To the foundations of mathematical analysis he contributed the introduction of a fully rigorous ε-δ definition of a mathematical limit [...] he was one of the earliest mathematicians to begin instilling rigor into mathematical analysis with his three chief mathematical works Beyträge zu einer begründeteren Darstellung der Mathematik (1810), Der binomische Lehrsatz (1816) and Rein analytischer Beweis (1817). These works presented "...a sample of a new way of developing analysis", whose ultimate goal would not be realized until some fifty years later when they came to the attention of Karl Weierstrass [...] Today he is mostly remembered for the Bolzano–Weierstrass theorem, which Karl Weierstrass developed independently and published years after Bolzano's first proof and which was initially called the Weierstrass theorem until Bolzano's earlier work was rediscovered." German wikipedia: "In einem Aufsatz von 1817 bewies er den Zwischenwertsatz und führte Cauchy-Folgen ein, vier Jahre vor Augustin Louis Cauchy. Bolzanos Arbeiten zu einer strengeren Grundlegung der Analysis wurden von seinen Zeitgenossen im Gegensatz zu denen von Cauchy kaum beachtet und erst in der zweiten Hälfte des 19. Jahrhunderts gewürdigt." PS: Recognition comes late. 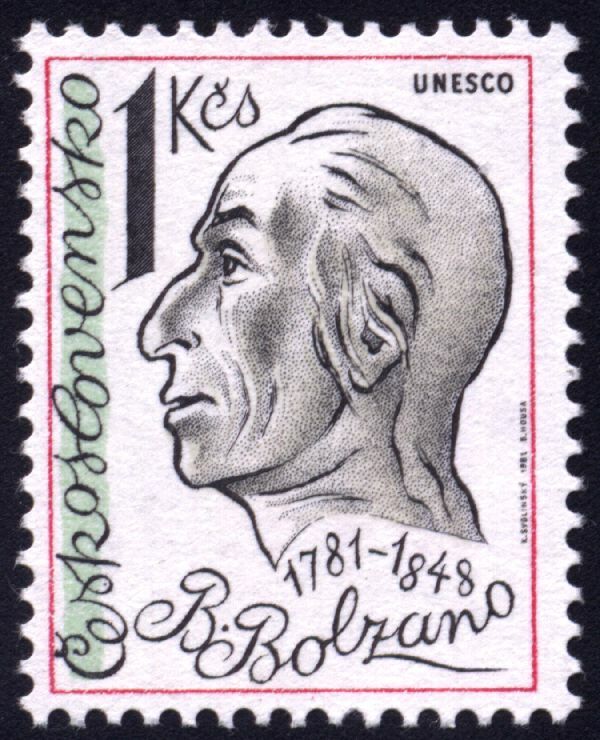 According to this site, Czechoslovakia (a country young people do not know anymore) issued this postal stamp honouring Bolzano in 1981. Louis de Branges and his proof of the Bieberbach conjecture. Oliver Heaviside probably deserves some mention here. I think he deserves a lot of the credit for the development of vector calculus. I would add Appel and Haken's computer assisted proof of the Four Colour Theorem to the list. "... In seeking to provide a sound conceptual framework for the subject [of homological algebra], they invented the notions of category and functor. These notions were slow to gain acceptance (the first Eilenberg-Mac Lane paper on categories was nearly rejected by the Transactions of the American Mathematical Society) on account of their seeming lack of content: for a decade or so, category theory was derided by other mathematicians as "abstract nonsense". But in time the substantial new advances made possible by the categorical way of thinking about mathematics won it acceptance: it has by now become an indispensable part of the vocabulary of the great majority of pure mathematicians (and, increasingly, of researchers in theoretical physics and computer science)." Also, a famous example is Hilbert's work on invariant theory. I don't know if there is truth in the "theology and not mathematics" story regarding Hilbert's first paper with the basis theorem, but in any case it took a while before this new way of doing algebra became accepted. One often hears established mathematicians commenting on the work of younger ones as "pointless generalizations". Sometimes, these pointless generalizations are used by somebody else to prove a result that attracts attention, and then the same established mathematicians will say "OK, this proved to be useful, but it was just an easy exercise that could have been included in the proof of the big result". It might take some more time before the younger generation actually recognizes the value of these pointless generalizations: not everything can be world shaking or even first class. Perhaps the papers by Black and Scholes, and Merton on the asset pricing of an European option. The paper was rejected by two journals before it was accepted for publication by a third journal. 1997 these guys (Black died before) became the Nobel Prize in Economics. Their work is regarded as the corner stone and pillar of financial mathematics. Descent theorems for fundamental groups and groupoids? Examples of results which were surprising but later shown to be natural. Notable examples of syntactic proofs whose existence is guaranteed by completeness, but having been found later than a semantic proof?